Beautiful 18 karat gold plated Kabbalah Tree of Life Sacred Geometry symbol. Size: 2.84 inches in diameter by .02 inches (same thickness as a credit card). 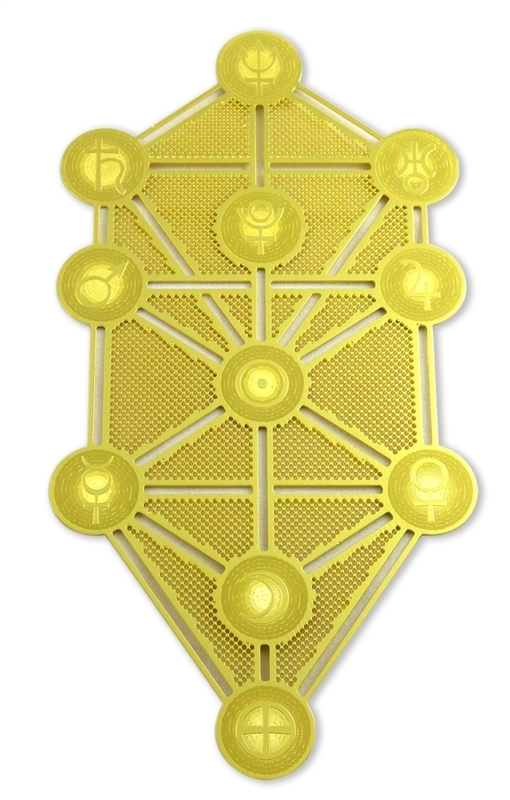 Gold plated Kabbalah or Tree of Life Sacred Geometry symbol. One side includes the corresponding planetary symbol for each circle or sephiroth. The other side has the name of it's corresponding planet, the english transliteration of its name and its meaning. The Kabbalah is a wonderful, deeply spiritual icon and has a long history dating back to the 13th century of those who studied it to gain enlightenment. Today too, it has a strong following of modern seekers who gain spiritual upliftment from its study. This lovely piece makes a wonderful accent to the sacred space, home, office, or vehicle. It also serves as a guide to learn each sephiroth or circle, its corresponding quality and planet.